Believed to be 220–490 metres in size, Apollo asteroid 2017 VR12 passes just 3¾ lunar distances from Earth at 07:53 UT (7:53am GMT) on 7 March. 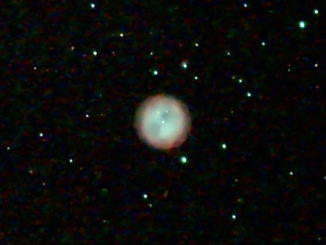 The body should exceed magnitude +12 near closest approach, making it a viable target for 10-cm (4-inch) telescopes and larger. Click the graphic to be taken to an interactive Java applet. Image credit: Orbit Viewer applet originally written and kindly provided by Osamu Ajiki, further modified by Ron Baalke (JPL) / Ade Ashford (AN). Make the most of any clear skies near the end of the first week of this month as you don’t want to miss 2017 VR12, a space rock the size of The Shard in London that hurtles past our planet less than four lunar distances away on 7 March. Predicted to exceed magnitude +12 at its closest, this near-Earth asteroid is a viable target for 4-inch (10-cm) aperture telescopes and larger as it rapidly heads south through the constellations of Coma Berenices and Virgo. Discovered by Pan-STARRS 1 in Hawaii on 10 November last year, 2017 VR12 is an Apollo-type asteroid that orbits the Sun once every 585½ days. Studies indicate that its size lies between 220 and 490 metres, rotating once on its axis every 1.4 hours with an amplitude of 0.2 magnitudes. 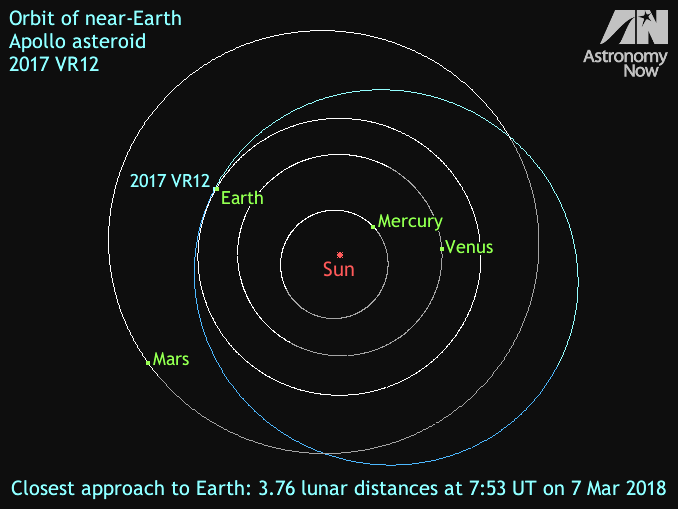 At 07:53 UT (7:53am GMT) on 7 March, 2017 VR12 passes Earth at a distance of 1.44 million kilometres (897 thousand miles), or 3.76 times the distance of the Moon. Although classified as a Potentially Hazardous Asteroid (PHA) by the Minor Planet Center, there is no possibility that 2017 VR12 will collide with Earth this time around – its closest approach to our planet for the foreseeable future. As darkness descends in Western Europe on 5 March, the asteroid lies in the constellation of Canes Venatici, crossing the border into Coma Berenices shortly after 20:30 UT. At 1:40am GMT on 6 March, 2017 VR12 passes just 0.9 degrees west of magnitude +4.2 beta (β) Comae Berenices, the star and asteroid visible in the same field of view of telescopes magnifying 30× or less. At this time, 2017 VR12 is a magnitude +12.1 object travelling at a rate of 0.7 degrees/hour against the background stars, or the equivalent of Jupiter’s angular diameter every minute. Observers situated in East Asia have a visual and astrophotographic treat in store as 2017 VR12 clips the edge of magnitude +7.7 globular cluster Messier 53 in Coma Berenices close to 13:50 UT on 6 March. Sadly for observers in Western Europe, this occurs in daylight. At UK dusk on 6 March, 2017 VR12‘s rapid southerly motion carries it over the constellation border into Virgo. This extract of a fully scalable PDF finder chart for 2017 VR12 shows the asteroid’s track during the period that it’s closest to Earth and visible from the UK & Western Europe. The hourly positions (Universal Time) are topocentric for the heart of the British Isles, so the path could be displaced by up to one-quarter of a degree by parallax for other global locations. Stars to magnitude +7 are shown. Click the graphic to download the full PDF chart for printing and use at the telescope. Equatorial coordinates (J2018.2 epoch) for 2017 VR12 on the hour are tabulated at the bottom of the page. AN graphic by Ade Ashford. Shortly after 4:30am GMT on 7 March, the magnitude +11.8 asteroid passes half a degree east of magnitude +4.8 star sigma (σ) Virginis. At this time, 2017 VR12 and σ Virginis lie within the same field of telescopes magnifying up to around 70×, the asteroid’s motion relative to the background stars being 0.9 degrees/hour, or the angular diameter of Jupiter every 50 seconds. 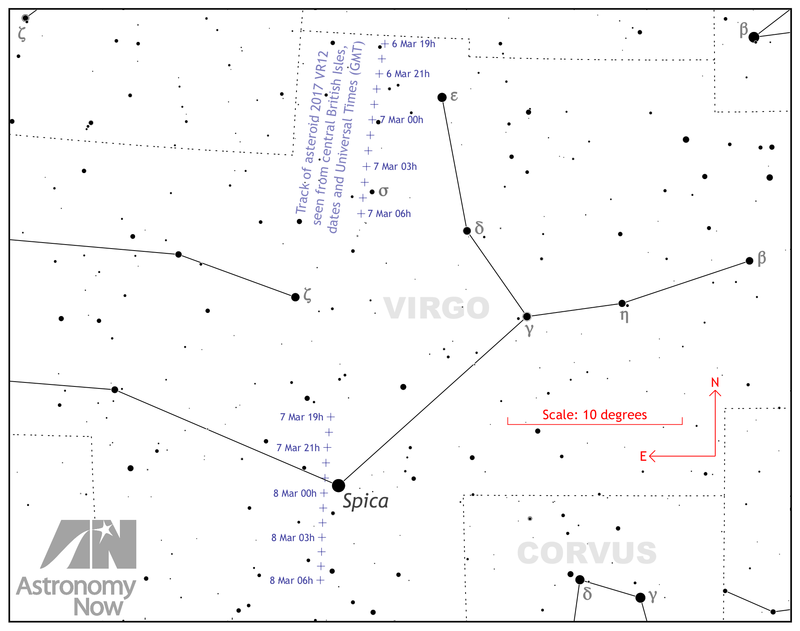 This finder chart shows the track of 2017 VR12 (dotted line) when it passes 0.8 degrees east of first-magnitude star Spica in Virgo at 23:30 UT (11:30pm GMT) on 7 March 2018 as seen from the heart of the British Isles. At this time the asteroid is predicted to be magnitude +12. The field is 2 degrees wide and stars to magnitude +13 are shown. Celestial north is up and east is left. AN graphic by Ade Ashford/Cartes du Ciel. 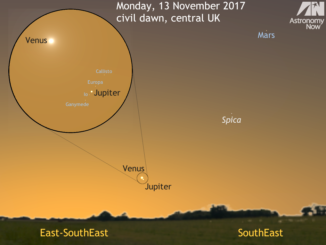 As night falls in the British Isles on the evening of 7 March, observers can prepare for the highlight of 2017 VR12‘s close flyby – its near brush with Virgo’s brightest star, first-magnitude Spica. 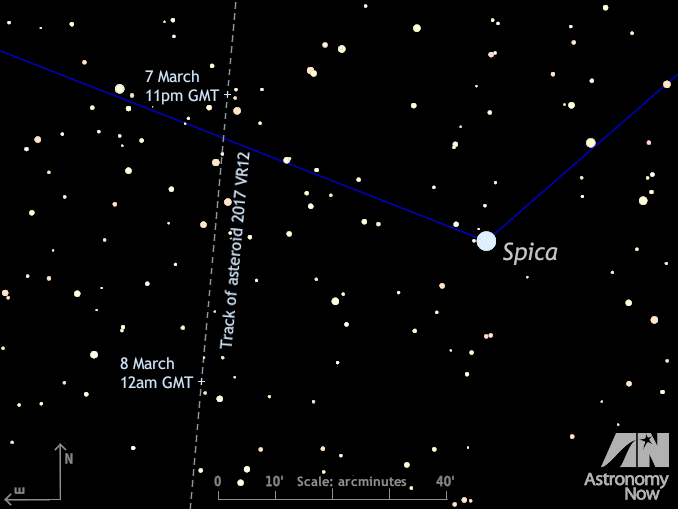 At closest approach, the asteroid passes just 0.8 degrees east of Spica at 11:30pm GMT. At this time, if you have a 4-inch (10-cm) or larger telescope with Spica centred in an eyepiece magnifying around 30×, you have an excellent chance of seeing the real-time motion of 2017 VR12 if its predicted magnitude of +12 holds true. If you don’t own a telescope, or it’s cloudy where you live, then why not watch 2017 VR12 online? The Virtual Telescope Project and Tenagra Observatories, ltd. are providing two opportunities to see near real-time images of the asteroid accompanied by commentary from scientific staff on Wednesday, 7 March. The first live broadcast from Ceccano, Italy starts at 00:00 UT (12am GMT), while the second live broadcast from Arizona, USA starts at 10:00 UT (10am GMT). To find out more, follow this link. The table above shows the position of asteroid 2017 VR12 every hour for the interval that it is brightest and visible from the UK and Western Europe. Universal Time (UT) is used, equivalent (for our purposes) to Greenwich Mean Time (GMT). An ‘M’ after the time indicates that the Moon is above the UK horizon. Topocentric central UK equatorial coordinates are for the current epoch (J2018.2) for direct entry into digital setting circles or GoTo mount hand controllers. The asteroid’s predicted visual magnitude (Mag.) and distance in astronomical units (delta) are also shown. Data credit: Minor Planet Center / NASA HORIZONS / Ade Ashford. 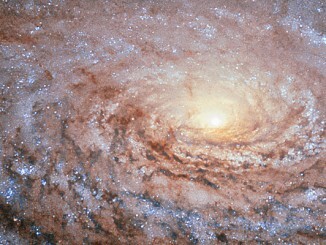 Galactic arms, sunflowers and whirlpools are only a few examples of nature’s apparent preference for spirals. A beautiful example is Messier 63, nicknamed the Sunflower Galaxy, its winding arms shining bright due to the presence of recently formed, blue–white giant stars and clusters, readily seen in this NASA/ESA Hubble Space Telescope image.